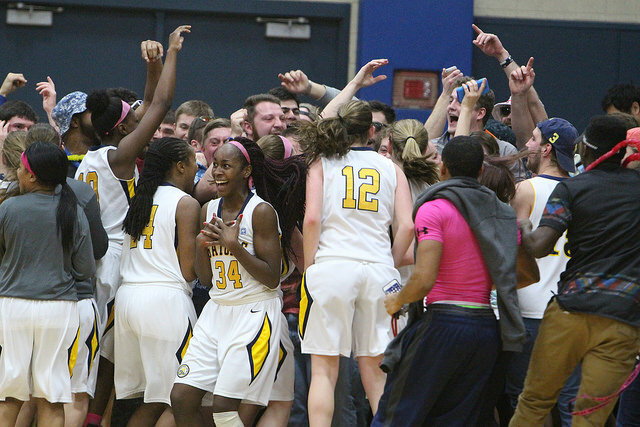 The women's basketball team celebrated a 58-50 win in the first playoff game against Oberlin College with fans on Tuesday, Feb. 23, 2016. The Allegheny women’s basketball team began its quest for a NCAC championship on Tuesday night with a first-round home matchup against Oberlin College. Before the game, Head Coach Kate Costanzo mentioned how exciting it is to host a playoff game on their home court. Even with this playoff win, Costanzo still focuses on improving team efforts. “In order to move on, we need to rebound well, force turnovers, and value each possession. If we play with the same energy and intensity that we’ve played with all season, we will be in good shape,” Costanzo said. Madison Caufield, ’18, guard, said the team needed to focus on what they did the previous two times to overcome Oberlin during the regular season. 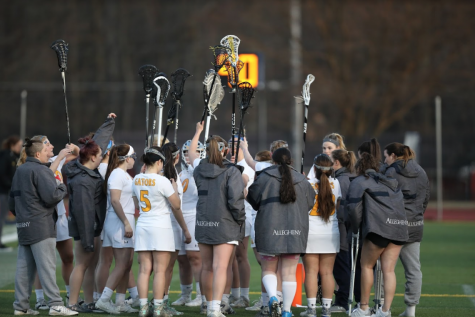 Fourth-seeded Allegheny (14-12, 8-8) used its pressuring defense to force 22 turnovers as the Gators advanced to the NCAC Tournament semi-finals with a 58-50 victory over fifth-seeded Oberlin College (12-14, 6-10). Allegheny was also led by senior guard Jessica Mrdjenovich who scored 12 of her game-high 18 points in the second half to close out the game. After being swept by Oberlin just a season ago, the Gators gave them a sweep of their own on Tuesday night by winning their third straight game this season against the Yeowomen. Mrdjenovich’s 18-point effort tied a season-high while also giving her three consecutive double-digit scoring performances to continue her hot streak. Senior Emma Pellicano nearly had a double-double, as she scored eight points and pulled down nine rebounds, while fellow senior Rachel Vigliotti led the Allegheny offense with six assists. Mrdjenovich had a unique mentality that she attributed to her successes in the first round playoff game. Allegheny’s defense ran a successful full-court press throughout the whole game which led to many of Oberlin’s mistakes. Costanzo said that her team works hard on defense which leads to the turnovers they force during the games. Ifeyinwa Uwazie, ’16, said the team focuses a lot on their defensive work and that’s why they show so much success against their opponents. “We take great pride in our defensive intensity and use a lot of communication, hustle, and teamwork to make it so successful in stopping our opponents,” Uwazie said. The fan base provided a supportive and exciting atmosphere for the Gators in the David V. Wise center. Jessica Mrdjenovich said that playing in front of such a supportive crowd helped with their win against Oberlin. Costanzo cannot thank the fans that came to cheer on the team enough for their support. “That was the best crowd that I’ve seen since I’ve been at Allegheny so we really appreciate all of the support,” Costanzo said. The Gators will now face the top seed in the conference and the 23rd ranked team in the country when they travel to Granville, Ohio to face Denison University. The team has already lost two tough matchups against Denison earlier in the regular season but look forward at another shot at the Big Red. Uwazie said that it will be hard to beat the Gators three times in the same season especially after two close games with Denison earlier in the season. Uwazie said that keeping a playoff mindset will set the Gators up for a successful run at the NCAC championship. “I think we need to continue to work with the mindset that the playoffs are kind of a do or die and a now or never situation,” Uwazie said. “One important part of that is having a good offensive game. Allegheny will continue its pursuit of the program’s first NCAC title in 27 years on Friday, Feb. 26 at 8 p.m. against Denison University.